← Have you ever… cried at a gig? 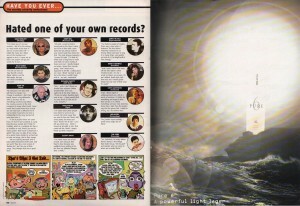 Have you ever…hated one of your own records? This entry was posted in December 1998 and tagged 60ft Dolls, Aqua, Catatonia, Cornershop, Elliott Smith, Hurricane #1, Stereolab, Stereophonics, The Levellers, The Prodigy, The Supernaturals, Tiger. Bookmark the permalink.